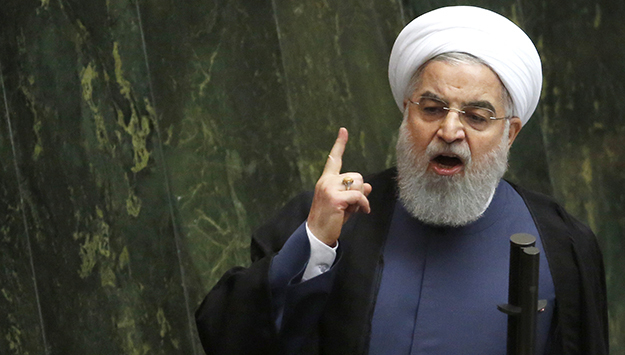 On Tuesday, President Hassan Rouhani appeared in front of Iran’s parliament to defend his government’s economic record. He faced a tough crowd. The body had already removed his economy minister, Masoud Karbasian, on Sunday. And before that, it had canned his labor minister, Ali Rabiei. Both were ousted on charges amounting to incompetence. No doubt, Washington’s policies under President Donald Trump are a major factor in a sudden economic plunge that has seen Iran’s currency, the rial, lose half of its value since April. But they aren’t the only problem; Rouhani even admitted as much in his remarks. A healthy economy, he said, requires “foreign investment and domestic political stability.” Those are both in short supply these days; the same rivals Rouhani urged to unite with him against the United States have systematically undermined confidence in the Iranian market and created domestic political mayhem since well before Trump’s inauguration. Rouhani, however, chose not to open that particular can of worms. He has apparently accepted the role of scapegoat, which he must think is the most politically prudent course to maintain his presidency and his power, including a shot at eventually becoming Iran’s supreme leader. But he is wrong, and he will very likely pay a high price for choosing not to go on the offensive.